This is one of four papers that grew out of a faculty workshop on the Hamdan decision held at the University of Maryland School of Law on September 21, 2006. 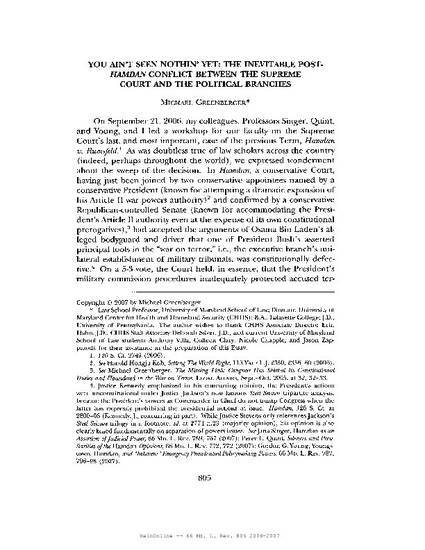 On September 21, 2006, my colleagues, Professors Singer, Quint, and Young, and I led a workshop for our faculty on the Supreme Court’s last, and most important case of the previous Term, Hamdan v. Rumsfeld. As was doubtless true of law scholars across the country (indeed, perhaps throughout the world), we expressed wonderment about the sweep of the decision. In Hamdan, a conservative Court, having just been joined by two conservative appointees named by a conservative President (known for attempting a dramatic expansion of his Article II war powers authority) and confirmed by a conservative Republican-controlled Senate (known for accommodating the President’s Article II authority even at the expense of its own constitutional prerogatives), had accepted the arguments of Osama Bin Laden’s alleged bodyguard and driver that one of President Bush’s asserted principal tools in the “war on terror,” i.e., the executive branch’s unilateral establishment of military tribunals, was constitutionally defective. On a 5-3 vote, the Court held, in essence, that the President’s military commission procedures inadequately protected accused terrorists, thereby reversing a panel of the D.C. Circuit in which Chief Justice Roberts, then sitting as a circuit judge, had joined. 66 Maryland Law Review 805 (2007). hamdan quartet symposium 2006.pdf (404 KB) Four essays tha grew out of a faculty workshop on the Hamdan decision held at the University of Maryland School of Law on September 21, 2006.